The Commission of National Inquiry (CNI) has released its report into the circumstances surrounding the controversial resignation of former President Mohamed Nasheed and the transfer of power on February 7. The CNI was initially a three member panel (Dr Ibrahim Yasir, Dr Ali Fawaz Shareef and chairman Ismail Shafeeu), formed by incoming President Mohamed Waheed Hassan to examine the circumstances surrounding his own succession to the Presidency. Nasheed and the ousted Maldivian Democratic Party (MDP) have maintained that the former President’s resignation took place under duress during a police and military mutiny, and that Dr Waheed’s government was illegitimate. The MDP and the Commonwealth subsequently challenged the impartiality of the CNI, and it was reformed to include retired Singaporean judge G. P. Selvam and a representative of Nasheed’s, Ahmed ‘Gahaa’ Saeed. Retired Court of Appeal judge from New Zealand, Sir Bruce Robertson, and Canadian UN Legal Advisor Professor John Packer, were appointed as international advisers representing the Commonwealth and UN respectively. Nasheed’s representative Saeed resigned from the CNI on the evening of August 29, denouncing its credibility and alleging that the final report excluded testimony from key witnesses as well as crucial photo, audio and video evidence. The investigation did not consider the police crackdown on demonstrators on February 8, focusing largely on the events of February 6-7. “The resignation of President Nasheed was voluntary and of his own free will. It was not caused by any illegal coercion or intimidation,” the report claimed. “There appears nothing contestable in constitutional terms under the generic notion of a ‘coup d’état’ that is alleged to have occurred – quite to the contrary, in fact,” the report claimed. In the course of its work the CNI interviewed 293 witnesses, 15 on multiple occasions. It also reviewed documentary evidence. “The Commission notes that in many disputes, there can be difficulty in getting to what actually historically occurred as opposed to what an individual now honestly and sincerely believes to have happened,” the CNI report stated. “Many people have heavy commitments to certain positions and on occasion their recollections were simply wrong. They had a recall that could not be correct when viewed alongside videos, photographs and other evidence. It is unhelpful to call this ‘lying’ but it must be allowed for as conclusions are sought,” it noted. “It is an inevitable conclusion of the totality of the credible evidence that the only available firearms which were anywhere near the President between 4.37 am and 1:30 pm on 7 February 2012 were those which were carried by his SPG [bodyguards]. There is no evidence to suggest that the arms in possession of the SPG were a threat to him,” the report stated, in its conclusion. The report dismissed claims by former Foreign Minister Ahmed Naseem that Brigader General Ahmed Shiyam was armed with a pistol in the company of Nasheed. “Yet another witness, the Minister of Tourism in President Nasheed’s government, Maryam Zulfa, said that it was Riyaz who had a gun. This was because according to her there was a bulge in the pant pocket of Riyaz,” the report stated. “Because illegal or unlawful acts or omissions were going on in the community, it seemed to be the view of a number of witnesses that this had the effect of coercing the President to resign. The Commission does not comment on the allegations of such activities because they are not within our mandate but there is clear and unequivocal evidence before us that there are serious allegations of wrongdoing by the military, the police and private citizens. For the Maldives to move forward, these matters must be addressed. “Indeed, until the time of his resignation, President Nasheed possessed of many powers under the Constitution that he could have utilized including the lawful use of force. He chose not to. “That decision may be classified as praiseworthy, but he cannot now contend that because he made those choices, that he was ‘forced’ into resigning because of what others were doing around him,” the report stated. The report also reviewed several definitions of the term “coup d’état”. Nasheed provided the commission with a “with a list of some 67 names, whose bank accounts and telephone logs he requested be scrutinised. These allegations were unsupported by any evidence,” the report stated. “All sorts of allegations were made against Retired Colonel Nazim on how he purportedly stalked President Nasheed, controlled his movements and dictated what he should say. Nazim, it was said, even wanted the pen used by President Nasheed to write his resignation. There was ample credible evidence rebutting these false allegations. “Such allegations are very easy to make and some naively suggested that if the Commission trolled through scores of bank accounts, telephone records, SMS logs and intelligence reports, all would be revealed. “The Commission lacks the ability to do so comprehensively, although when it made specific requests in individual cases, information was provided and revealed nothing of consequence. “After hearing him, the Commission would not invade and investigate the privacy and personal affairs of all and sundry as desired by President Nasheed and his aides in the absence of minimally credible supporting evidence,” the report said. “A coup d’état required positive action against President Nasheed. Non-action and inaction cannot constitute a coup d’état. Moreover, the Constitution does not call for loyalty of anyone to the President. It calls for the loyalty to the Constitution. Its a coup no matter what the findings of CONI is. Judge from the commonwealth being bribed is pathetic! Shame on you Fawaz, Yasir and Shafeeu. Today you can go hide and smile from ear to ear, but Insha Allah, there will come a day when your conscience will bother you for your actions, and when you will be sorry for choosing your personal gains over the interest of the nation and it's people. Shame on you all for the rest of your lives. I say there was no coup. Qum faya kun. Mr. Shafeeu, Mr. Fawaz and Mr. Yasir! Just one simple question. Can you please tell me the legal reasoning or a justifaction for the vice president for issuing a public annoucement concerning the prevailing delicate affairs of the state independently of the president without his knowledge or consultation and then becomes uncontactable to the president, nor does he attempts to contact the president. You three are nothing but the greatest traitors this nation had seen. May people call you whatever names they think fit you deserve them. Given the brazenness of this government to distort facts that insult the commonsense and conscience of the common people, it was highly perceptible that CONI report would be concocted and cooked up to legitimize the regime. To legitimize a coup would be more crucial to stay in power than to execute a changeover of government through mutiny and brutality. Possibly their next move could be to imprison Anni. This is highly likely considering the several recent court verdicts in favour of the alliance defendants in stark criminal cases. Chief Justice seems to cringe in the face of manipulation and intimidation aimed at him and the bench. Thus, Hulhumale’ Magistrate Court is being used to pass the sentence on Anni for the opposition’s long awaited imprisonment to eliminate him from the next Presidential Election of 2013. If the much expected kangaroo court verdict materializes as planned, Presidential elections might be held as expected in 2013. Should this does not come about the regime’s next move might be to amend the constitution in order to prolong and rubber stamp the remaining days of President Waheed for a full five year term to prevent Anni contesting Presidential Election with high chances of reelection with a landslide. This would not come as a surprise given the brazen tenacity of the current alliance to go beyond healthy rivalry as political opponents to the extent of forcibly toppling the legal government through open aggression in February 2012- apparent premeditated mutiny of policemen and soldiers not necessarily the security forces as a whole though it snowballed into full scale failure of the security forces to address the situation. The entire aggression was based and rooted on the premise that Anni would not brutalize his political opponents as a result of his being the liberal democrat that he has long been. Internal aggression against the state of Maldives is being portrayed as mere co-incidence of Anni’s approach to politics. This is being perpetrated using the government machinery and sponsored media whose bias against MDP and Anni is the hallmark of their perpetuation of the status quo as it existed during Gayoom era. People of the Maldives have been subdued through intimidation, fear and distortion through virulent propaganda that transfer of power had taken place according to law. Only time will tell. Right, there we have it, it was not a coup! Now, let's calm down and try to move forward. All sides ought to learn valuable lessons from this saga. MDP ought to consider the fact that they signed up to agree with the conclusions of this report, whatever the outcome. Now that the outcome is not perhaps what they foresaw, they should show maturity and leadership and learn lessons from innumerable mistakes they made whilst in power. We didn't need a judge from Singapore (http://bit.ly/NE6JHe) for this. They could have paid less for some random person from the street and given a copy to sign. Look at Mohamed Nasheed's resignation speech on video, and the subsequent claims and behaviour of Mohamed Nasheed. There is ample proof that he was forced to resign by the security forces, who were instigated to do so by other powerful elements in Maldivian society. These elements of society are now in power. They used Islam to do what they did. They also used military power. There is no doubt in my mind that Mohamed Nasheed was removed by a coup. That Mohamed Nasheed himself and his friends contributed to the cause of his downfall is also clear. But the larger question remains. The Constitution that came into force in 2008 did not envisage what happened. The crisis could easily have been solved by an immediate holding of a presidential election. The people of Maldives would have spoken and decided the fate of the country. There would have been a clear victory for democracy. 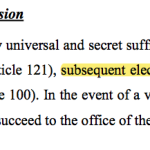 According to the provisions of the Constitution, There will be no presidential election until 2013. This has given the coup leaders the opportunity to consolidate themselves in power, and appear to be doing the right thing. Mohamed Nasheed and his friends have dug in to resist. This presents a big problem that could have been easily avoided. There is another crucial issue. Mohamed Waheed was Mohamed Nasheed's running mate and vice-president. So Mohamed Waheed to become president in this manner is, frankly, not a good precedent for a tiny infant democracy like Maldives. Justice must not only be done, it must be SEEN done! For the life of me, I don't see any justice done here. This will come back to haunt us one day, sooner or later. Dajjal's Coup government sunk their teeth and claws even deep into the hopes and freedom of every Maldivian. If you don't like me calling Dajjals to the thugs of this coup government, then do a Google search for the meaning of dajjal in Arabic. What an absolutely disgraceful outcome. What a spineless bunch of pussies that sat on the CoNI commission. I am ashamed that my country Australia, did not support the elected Govt in Feb when it was needed. Fight on Maldivian people, justice will come to you. MDP, MDP !!! Australians should tend to their Kangaroos and Koala Bears instead of meddling in our affairs. CONI report has made its decision and that means it's the truth, regardless of what happened on that day.Legally, there was no COUP, regardless of whether there was one or not; so no coup. Law is law. CoNI has done a comprehensive and a thorough job. Now facts are clear crystal to the questioning minds regarding the legitimacy of the present Maldivian government. Now MDP and Mr. Naseed's claim is rejected and the real picture of the formers are revealed to the world. there's no coup because there is resignation. A resignation is the formal act of giving up or quitting one's office or position. now all the rest of the reports by JJ and by minivan news will contain selective excerpts from CONI report taken out of context or deliberately presented to tow MDP's line. they will give more importance to what is said about the report rather than what is actully written in it. in this sense, they will keep on writing hameed gafoor's comment that commonwealth has legitimised coup. this tactic will be followed by all the subsequent reports by this site on this subject. expert propagendists!! My absolute favorite part of the story below! The old "I don't recall" defense used around the world by guilty politicians. I also love how saying those three words was described as "effortlessly debunking the sms claim". lmfao for Singapore Judge Selvam...the distribution of 2.4 million Rufiaa to mutinying policemen is too private and invading privacy of Mr Saleem, the Permanent Secretary of the Ministry of Environment. It would invade the privacy of the policeman that took bribes to look at their bank accounts and cellphone records? As a lawyer, I must say this whitewash does not meet international standards. America, like the rest of the World that is allowing this unlawful change of government to stand, should be ashamed. There was no coup. We saw clearly on TV that he resigned, and the things he said on TV that day probably must have been different if it was a coup. He could have just showed a disappointed face and said im resigning and no more sweet words. This disappointed face only appeared on the next day. I think there is too much pressure on him by some radical comrades of him. I advice him to forget about those useless comrades and get more closer to his family or do something related to carbon neutrality (if he really loved environment as it appeared during his preidency) or promote one of his pleadges that was on transportation network. He can continue to work on it because thats what he studied at his degree. No matter what any report says what our eyes saw will remain the truth. And it was a Coup. Waheed is the biggest traitor this nation saw along with those three Maldivian p"£$£"s who compiled this report, i hope at least in afterlife they get what they deserve. CONI (Commission of National Inquiry) consisted of three groups. Group One represents of President DR. Waheed's side and include the following three members: Shafeeu, Fawaz and Yasir. Group Two represents ousted President Nasheed's side and included Mr. Saeed. Group Three represents the Commonwealth and this group includes Retired Judge Selvam from Singapore. Justice Selvam was an independent and not partial like the other members of the CONI who were either President Dr. Waheed's or President Nasheed's "members". Although the CONI members did all the work, all their work was carried out under the careful scrutiny, close observation and legal advice from two distinguished international observers representing the United Nations and the British Commonwealth of Nations. The two distinguished observers were: Sir Bruce Robertson,a retired Appeal Court Judge from New Zealand, and Professor John Packer, a distinguished Canadian who works at the United Nations as a Legal Advisor and who is also a professor of law at University of Essex. These two distinguished law experts, who have spent their whole professional life dwelling on legal affairs, have a wealth of legal experience and legal knowledge that can impartially assist the CONI work and steer the CONI works clear and away from the detrimental affects arising from the Maldives' biased partisan political party views and baseless rhetoric. So, given the legal weight of the CONI observers and their endorsement of the CONI report, I believe, there is little or almost no legal ground available for the local Maldivian politicians to play hit and run and then shout. The international community and international bodies cannot go on spending resources again and again investigating whether the change of power in the Maldives was due to a coup d'tat. There are other pressing issues now such as Syrian conflict and investigating Sri Lanka conflict. It is time we become rational and prepare for the next election, that is change the government through the ballot, the way we had done it before. Kaza, you are right. But Anni is not a person who will accept any defeat and he always want to win nothing else. Anni always want others to listen him and he do not want to listen to others. This is the major reason why he lost his post too. Now for Anni, common earth, UN , US and India are part and parcel of the coup and they all are behind bringing the coup ? What a double standard from Anni ? Anni is not a leader and he is an activist. alliance could split if one candidate is fielded, they won't do it. If one candidate is not put forward, MDP could sweep the elections with a landslide for wastage of votes due to divisiveness. Dangerous for the people and safest for the perpetrators would be to bribe their way through to "deface" constitution to lengthen the term for Waheed. God help Maldivian people; the country is being held to ransom with veil of legality through broad day light deception before the people's eyes. the UN, Commonwealth and CONI have gone to dogs with venal reps condoning crimes, mutiny defying logic and rules of engagement. but bunch oc cowards, hitting unarmed old n women!!!! so hey, you can win a battle, but it doesn't mean the war is over!!! Simple question. Why would Nasheed, a reining president with all its perks resign unless he is physically threatened? He did this only to save his skin.